I’m having a little trouble with this one. But I think I’ve figured out why. 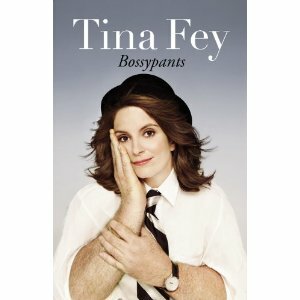 I enjoyed Bossypants , it was a fun quick read but I didn’t have many of the laugh-out loud-moments that other readers experienced while reading Tina Fey’s book. Here’s the best reason I can come up with – it just didn’t sound like her to me and that was part of the reason I was not able to fully invest in the experience. I should admit at this point that while I like Tina Fey a lot, I don’t watch 30 Rock. This may also be part of the problem. There are some chapters in this book to which I would pledge my undying loyalty. These are the chapters in which her comic timing and dead-pan delivery are at their best and she’s telling us something True. Yes, that capitalization was intentional. Here’s why: In several places in the book Tina tackles some universal truths about growing up and being a Gen X or Gen Y woman. Shows us how it went for her. These are the chapters I love, including All Girls Must Be Everything, Young Men’s Christian Association, Remembrances of Being Very Very Skinny, Remembrances of Being a Little Bit Fat. These chapters are all in or near the beginning of the book, generally when Fey is discussing the pre- or early SNL days. I had trouble with the second half of the book. I think some of that is the aforementioned lack of 30 Rock watching but also the experience of being married with a kid. I am neither of those last two things, and while I do understand and have experienced the guilt that comes from a job which requires strange hours and can, at times, keep you from family and friends ; Fey’s chapters in regards to that phenomena didn’t strike a chord with me. What did strike a chord with me was when she describes knowing that an ally had arrived at work when Amy Poehler announced to Jimmy Fallon that she didn’t really care if he thought her jokes were appropriate. I have felt similar, although I don’t work with or even near comedians, when female coworkers walk in and assert themselves as a professional and demand to be treated on an equal playing field with men who will instinctively try to place them in safe boxes. So, what am I saying here? I’m telling you I enjoyed the book, even though there were places where Fey inserted scripts/jokes from SNL and 30 Rock and that felt lazy of the writer. There’s no need to publish a 270 page book if you have to include lesser material or material that is available elsewhere. If, instead, Fey had inserted marked-up scripts that showed the editing and revising process and discussed that process I wouldn’t be complaining at all. Would I recommend this book? Yes, but would probably only to someone who is quite the Fey fan. Darrell Hammond is best known as the SNL cast member with the longest run (14 seasons). What is less known is that for decades he has battled mental illness as well as alcohol and drug addictions. In his memoir, God, If You’re Not Up There, I’m F*cked, Mr. Hammond takes us through the parallel histories of his demons and his career in comedy. I finished this book this morning and I’m not sure how I feel about it. I’m not sure that I’m going to have a firm decision about this book so I’m forging ahead. I know that I don’t feel it was as successful as American On Purpose by Craig Ferguson. The lows were by far lower and told with just as much honesty. But… there’s a but. The non-linear storytelling which I was happy to praise in The Immortal Life of Henrietta Lacks by Rebecca Skloot, in this case it just doesn’t accomplish the same goals. Hammond attempts to tell us the story of his abuse at the hands of his mother and a former soldier father who was more often than not checked-out and how that affected his adulthood in Florida and later in New York as he remembered it while going through therapy and several rehabs. The problem with telling us the story of his flashbacks as he experienced them while also stepping away from it in other chapters to basically do a laundry list of the celebrities, sport starts, and politicians he encountered while being a working comic both pre and post SNL is that there lacks an overarching structure to this work. What Hammond does right in this work is lay it all out, with nothing left in the shadows any longer. Jail, rehab, and alcoholism, run-ins with the mob, trauma, and a night in a crack house – it’s all there and honestly told. This is a man still in the fight for his life and the ability to be the type of father he wants to be for his daughter which his own parents were not for him. I wish his luck. Let’s start my summer comedy tour! Wherein comedians tell us about their vices and demons and make us laugh. I should start out by saying that I am a ridiculously devoted fan of the slightly creepy but undeniably lovable Craig Ferguson, host of The Late Late Show. I record his show nightly because I can’t stay up for the entirety of it and I really want to watch them, so I view them the next night when I get home from work. I find this a lovely way to unwind from the stresses of my job and commute. In his memoir, American On Purpose: The Improbable Adventures of an Unlikely Patriot Ferguson delves into his childhood and family in Scotland, his incomplete education, adventures in punk rock/bartending/comedy/acting, alcoholism, failed marriages, emigration to the United States, and choice to become an American citizen and what he means to who he is and what his ancestry means to him. Needless to say, he covers a lot of ground. Avid fans of his show (c’mon, there’s more than just me) will be familiar with a lot of the material covered in this book from 2009. Some of the topics at hand – his year living in New York, his decade of active alcoholism are common enough talking points on the show. Many of the memories shared in this book would’ve been brand new if I hadn’t watched his shows from Scotland where he covered even more of his personal history. By which of course I mean the psychotic killer ducks of Kelvingrove Park. What I appreciate about Craig the show host is what I appreciate about Craig the author. He is unflinchingly honest. This is perhaps clearest in the portions of the book where he is recounting the end of his first two marriages, his alcoholism, and less than stellar foray into movies in the early 2000s. He claims guilt and responsibility for his actions, explains how things worked for him, doesn’t shy away from the dirty details, and in certain instances points out when others have screwed the pooch. This is an honest, at times very funny story of a man working his way through himself and pulling back the curtain to let us common folk have a view and find ways to complete what we’ve gone through ourselves. There is something truly lovely about reading a book where the author has done their own photography. This is the case in the beautiful book One Thousand Gifts by Ann Voskamp. Mrs. Voskamp uses her photographs to illuminate the story she is attempting to tell – that gratitude is the beginning of self discovery. I received this book as a graduation gift from a lovely friend. Voskamp uses her faith and the finding of small joys to illuminate what is perhaps a universal need: to slow down. 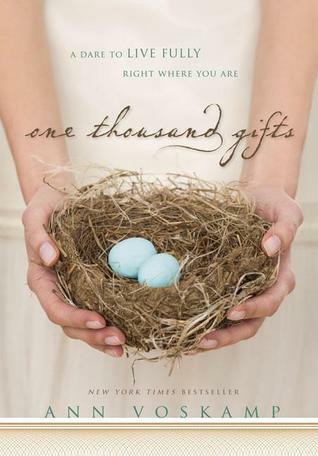 Voskamp’s journey starts as a challenge to journal 1000 gratitudes, but she keeps write on going and crafts what she has learned into this book. I would suggest this book to anyone who needs to stop and smell the roses and is not off put by the open christianity around which this work is based. Truly a quick read at just over 100 pages.